This review originally appeared on the Veg Girl RD website. There is no shortage of nutrition bars on store shelves. According to Business Insider, as of 2015 there were over 1,000 to choose from with predictions of continued growth. What’s the appeal? Why have we as consumers decided to reach for bars on a regular basis to feed ourselves? It’s probably a variety of reasons like convenience, availability, and a hefty dose of marketing. If we can get 300 calories and a decent amount of fiber and protein in bar form, why would we cook a meal and deal with the shopping, prepping, and dirty dishes? Bars can be eaten one-handed so we can multi-task or exercise while we’re noshing, they have a long shelf life so we can stock up and stay nourished for a while, and they require no preparation except opening the wrapper. What could be better? The main problem is that most bars are considered a processed food. If you check the ingredient labels you’ll find soy protein isolate, cane syrup, and rice flour which started out as soybeans, sugar cane, and rice, respectively. You might also find rolled oats, which originated from whole oat groats, and which is technically a processed food but still considered a reasonably healthy choice. Better yet, you’d find whole unadulterated foods that are simply ground up and pressed into bar form like walnuts, raisins, and maybe some chia seed. That’s what I look for if I’m in the market for a bar, which honestly isn’t too often. But a friend sent me a link a few months ago for a company with a unique take on this bar business: they make the dough and you do whatever you want with it. Unwrapp’d looked intriguing and the ingredients met my criteria for minimally processed whole foods so I ordered up a delivery of three of their fabulous flavors. At first, this one tasted like fruit sweetened cookie dough, which is not too surprising considering that’s essentially what it is. With each additional mouthful, as my taste buds and expectations adjusted, I so appreciated the moist sweet flavor of dates instead of a typical flour- and sugar-based dough. Cocoa nibs do a stellar job standing in as (minimally processed) dark chocolate chips and provide the all-important texture for any chocolate chip cookie dough imitator. This one was also reminiscent of cookie dough (perhaps pecan sandies?) with the big chunks of pecan providing a nice bite. It had an almost buttery or caramelly undertone which is impressive considering there’s no butter and no caramel. Wow. My favorite of the three. It had a great coarse consistency like crunchy peanut butter but with a flavor that was very much like dessert. They’ve created a fudgey yumminess accented with refreshing mint notes using only six ingredients. It absolutely tasted like I was scooping brownie batter straight from the mixing bowl. And I loved it. I followed their suggestions, eating it raw, frozen, and baked. You can also blend it in a smoothie, or make it into granola or muffins. I liked having it around for a quick, sweet snack that felt indulgent but didn’t go too off the rails in terms of calories and sugar. They made a nice addition to my bento lunch box when I was in a hurry one morning to fill the little compartments. The nutrition label notes 8 servings per container of 1.5 ounces each. For my preferred minty flavor, this will give you: 160 calories, 7 g fat (1.5 g saturated), 0 mg cholesterol, 80 mg sodium, 23 g carbohydrate (4 g fiber, 17 g sugar), and 3 g protein. My little scoops/bites you see in the pictures were 0.5-0.6 ounces each, so about 50-60 calories. Unwrapp’d’s dough will run you $9.49 for a 12 ounce jar, and they also offer Peanut Butter Chocolate and Banana Nut Muffin in their flavor round-up. It’s not available in stores so your only option is mail order with a $4.50 Fed Ex charge for shipping. However, if you’re lucky enough to live in Denver, they’ll deliver to you for free! 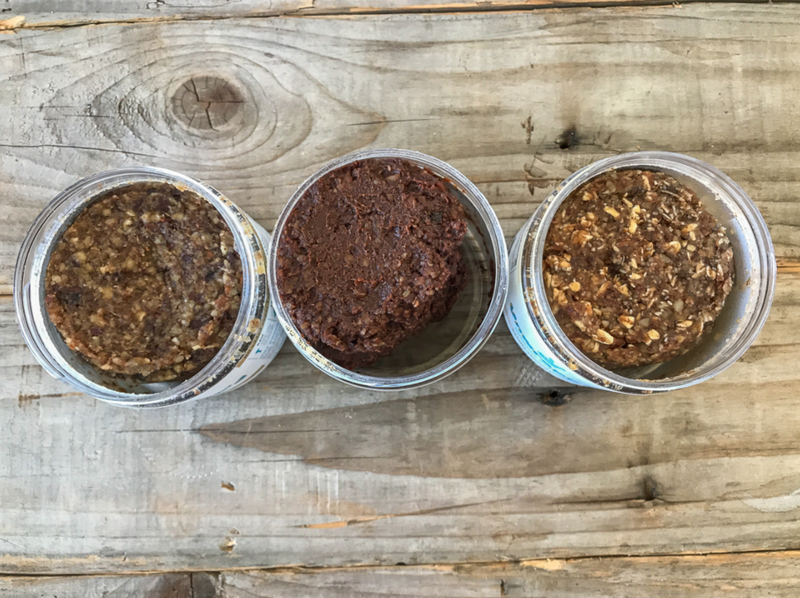 I’m a fan of this do-it-yourself dough, but if you’re not into building your own bars, there are a few brands on grocery store shelves that dietitians recommend. Ideally, we’d all be cooking everything from scratch and limiting our reliance on ready-made foods, but as much as I like the idea I don’t suppose it’s feasible all the time. So I’m grateful to find some products that meet somewhere in the middle and offer convenience packaged up with a little nearly whole-food nutrition. Unwrapp’d has it made. Sugar in Fruit vs Added Sugar: What's The Difference?